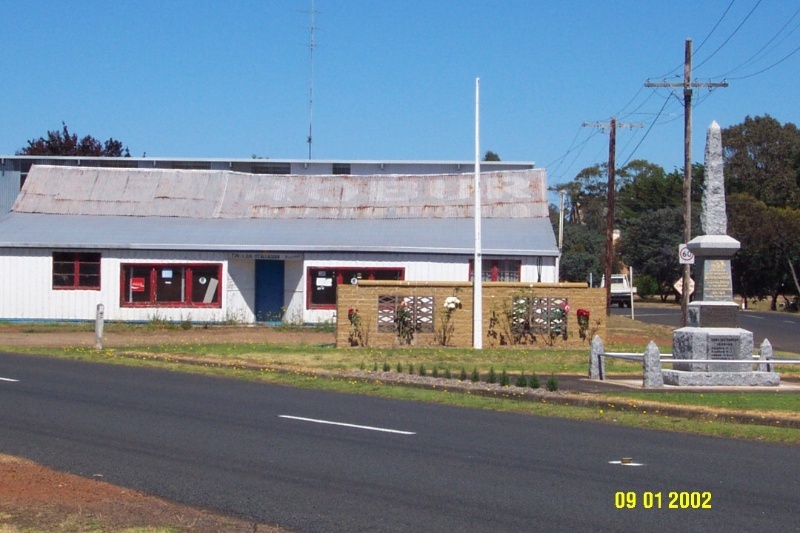 There are two war memorials in Balmoral, located at the intersection of the two major roads leading into town. The earlier memorial, erected after the First World War, takes the traditional form of a mounted granite obelisk.The die is inscribed on its north, south and east sides with the names of those who served in World War One. The names of those who served in the Second World War have been added as plaques on the east side. Above the die is a tapered cornice stone and this is surmounted by a rough hewn granite obelisk. The memorial is surrounded by a low fence of steel piping held up in each corner by small obelisks of rough hewn granite. The later memorial takes the form of a low wall and is constructed from light brown textured concrete bricks ['Besser Bricks'] with two panels of perforated concrete blocks set into the wall. These memorials were erected after each of the World Wars by the people of Balmoral as a tribute to those who served and those who fell in each of the great wars. The Balmoral War Memorials are of historic, social and aesthetic significance to the township of Balmoral and the Southern Grampians Shire. The Balmoral War Memorials are of historic significance because they commemorate at a local level some of the most important events in the national history of Australia and especially the roles of those from the community who served and died. The memorials are of social significance as the focus of acts of commemoration such as Anzac Day and Remembrance Day, and as a place of homage for the community. They are of aesthetic significance for the use of traditional form, style and iconography to express deep meaning. This is enhanced by its setting and location. The granite war memorial is in good condition. The concrete block war memorial is in good condition but two capping blocks may be missing from either end. The earlier memorial, erected after the First World War takes the traditional form of a mounted obelisk. It is constructed of granite, and has a height of 13 feet 7 inches. The base blocks and the two blocks which form a plinth are of rough-hewn granite. The die is of polished granite. The die is inscribed on its north, south and east sides with the names of those who served in World War One. Other names of those who served in the Second World War have been added as plaques on the east side. Above the die is a tapered cornice stone and this is surmounted by the rough hewn obelisk. The memorial is surrounded by a low fence of steel piping held up in each corner by small obelisks of rough hewn granite. The later memorial takes the form of a low wall and is constructed from light brown textured concrete bricks ['Besser Bricks'] with two panels of perforated concrete blocks set into the wall. It is approximately 6.0m long and 1.4m high. The flagpole, painted red white and blue in thirds, stands immediately in front of the memorial wall.